Cut the eggplant into pieces. Lay flat on paper towels and sprinkle lightly with sea salt. Let the eggplant sit for at least thirty minutes. Dry with the paper towels. Take two bowls. Crack and scramble the egg in one and put the crumbs in another. Heat about an inch of vegetable oil in a pot. 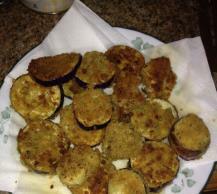 Dredge the eggplant in the egg and then the breadcrumbs. Flip over so both sides are well coated. Place the eggplant into the oil and fry on both sides until browned.